In several Maine, Nevada, Montana and Nebraska counties more than 25 percent of residents are older than 65. 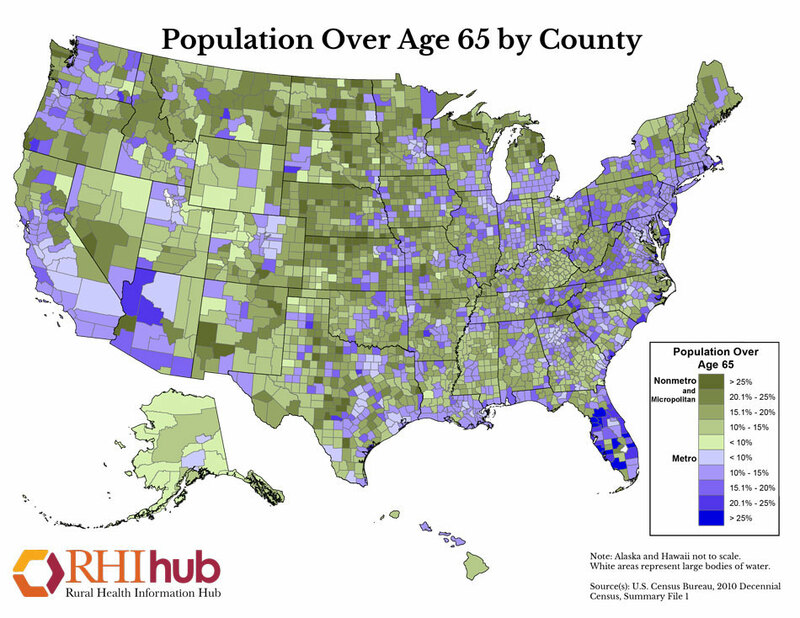 The darker green areas on this map from the Rural Health Information Hub represent counties where more than 20 percent of the population is over age 65. Click on the image to see the larger map. A key portion of America's demographic future is showing up first in rural areas, where a greater proportion of the population is older than, on average, residents of urban areas. "Rural areas are aging at a faster rate than the general population," notes the Rural Health Insurance Hub, adding that "older adults also disproportionately live in rural areas." In 2010, one-quarter of all Americans age 65 or older lived in small towns and rural communities and that number is growing. In reporting that the population of people age 85 or older will more than triple from 5.8 million in 2010 to 19 million in 2050, the Housing Assistance Council declares, "This change will have profound implications in rural regions which already have a larger share of seniors and a smaller share of social services than suburban and urban communities." The realities of rural aging are playing out nationwide, and the states with the largest percentages of older rural and small town residents can be found in every region. The top 10 such states are Delaware, Florida, Iowa, Oregon, Maine, Arizona, North Dakota, Virginia, Minnesota and Nebraska. Those stats and realities served as the backdrop for several sessions and a wide-ranging focus group conversation at the AARP Livable Communities National Conference held in Charlotte, North Carolina, in November 2018. The LOR Foundation, whose mission is to support the prosperity and preserve the character of rural communities throughout the Mountain West, was a conference sponsor. With 5 million member households located outside of large urban or suburban areas, AARP is one of the largest organizations representing rural and small town residents. A survey by the LOR Foundation found that urban and suburban dwellers were twice as likely as those living in rural areas to say the quality of life in their community had declined over the past year. Eighty-five percent of the survey respondents — drawn from the conference’s attendees and subscribers to the AARP Livable Communities e-Newsletter — were age 55 or older. The survey was conducted in November-December 2018. As the importance of community livability for people of all ages becomes more evident across the United States, it's critical for elected officials, local leaders, businesses and nonprofits to fully understand the issues, challenges and opportunities facing rural communities. "The overwhelming majority of rural seniors desire to age in place," states the Housing Assistance Council in its report "Housing an Aging Rural America: Rural Seniors and Their Homes. "Unfortunately, aging in place can prove difficult in rural regions where spread-out geographies and a lack of public transportation make accessing needed supportive services and amenities difficult. Home retrofits are often necessary for many seniors as their homes may become less accessible as they age, although these can be cost-prohibitive. Furthermore, seniors’ incomes do not always match their housing costs, decreasing their ability to remain in their homes." Despite the many challenges that need addressing in rural communities, the AARP-LOR focus group — which included community leaders and AARP staff and volunteers from a dozen states stretching from Maine to New Mexico — painted a vivid portrait of rural life today and what smaller communities can do to ensure a bright future. The gathering's optimism about rural America was validated a month later when a Gallup Poll found that although 80 percent of the U.S. population lives in metropolitan regions, a majority would prefer to live somewhere else: 27 percent favored rural areas, 17 percent selected small cities and 12 percent said they'd like to reside in a small town. The Gallup findings were affirmed by the LOR Foundation survey cited in this article's sidebars. KTWH 99.5 FM, a community radio station in Two Harbors, Minnesota (population 3,700), was created by and is largely staffed by older volunteers. While a sense of community was listed as "very important" by 59 percent of respondents to the LOR survey, only 26 percent reported being "very satisfied" with the sense of community in their town. This suggests that expanding volunteer and social initiatives could significantly contribute to better a quality of life in rural communities. To learn about KTWH-FM community radio, read "Two Harbors Takes to the Airwaves." Life can feel increasingly isolating for older adults, especially when due to age or disability they are dependent on relatives for their daily needs, reported Therese Picasso-Edwards of the Red Lodge Area Community Foundation in Montana. However, older people who are able-bodied and energetic often become "jack-of-all-trade" volunteers. "Older people do the bulk of volunteer work and do it well because of their lifetime of experiences," offered Anne Schroth, program director of the Healthy Peninsula community wellness initiative in Maine. "We need to seize every opportunity we can to celebrate volunteering," said Brad Anderson, director of AARP Iowa, adding that it's important to identify and extol "star" volunteers. Doing so helps remind everyone that older people are assets, not liabilities, to their communities. Great distances and a lack of medical providers can make it difficult for rural residents of every age to access health care services. The focus-group participants offered some ideas for lasting improvements. Eric Gaikowski, director of AARP South Dakota, advocated for increasing the availability of tele-medicine, where doctors living far from their patients can regularly check in by computer. Better doctor-to-doctor communication can also save lives, as happened when an ER doctor in Sioux Falls, South Dakota, guided a less experienced practitioner at a rural Montana hospital 700 miles away in performing surgery on a young girl badly injured in an ATV accident. The Tolani Lake community is part of the Navajo Nation in northeastern Arizona. The closest shopping (a gas station and mini market) is an hour away. The nearest hospital and physician offices are even farther. "Access to quality health care" topped the list among respondents to the LOR survey, with more than 4 out of 5 calling it "very important." Slightly more than half reported being "very satisfied" with what's available to them, but opinions varied according to gender: 62 percent of men expressed strong satisfaction with their health care compared to 47 percent of women. To find health-related livability strategies and solutions, order or download the Roadmap to Livability: Health Services and Community Supports Workbook. LaMonte Guillory of the LOR Foundation (read our "5 Questions for ..." interview with him) asked what role rural areas can play in the future of medicine. "How can rural attract projects that are pushing the boundaries on medical innovation? Telemedicine, robotics, collaborative care models, you name it." It was also suggested that paramedics pay home visits to older people to assess their nutrition, living conditions and overall health. Forging partnerships on health care campaigns was raised by a number of participants. "Don't reinvent the wheel," counseled Bill Menner of the Iowa Rural Development Council, noting that "every state has a rural health association." Just as in urban areas, older people in rural areas will continue driving even after it is no longer safe. The reasons are obvious — living without a car in most communities means limited mobility options. Funding transportation for older citizens is a challenge, said Joy Beressi-Saucier, director of the Aroostook Area Agency on Aging in Northern Maine. Cuts to public transportation services in rural areas have been devastating. In Colorado, AARP is working to expand intercommunity bus service. Rural transit in Vermont is generally good, observed Kelly Stoddard-Poor of AARP Vermont, but there's a significant need to improve "last mile" mobility for people getting to and from bus stops. Sue Lessard, town manager of Bucksport, Maine, shared that the local bus service in her region once ran only one day a week — precisely the day the doctor at the health clinic specializing in older patients did not work. Valerie Lefler (third from left), founder of Feonix: Mobility Rising, a transportation service for rural and underserved communities, poses with her colleagues at the Chimney Rock National Historic Site in western Nebraska. Transportation — or "ease of getting around" — was cited as the second-most-critical issue after health care, with more than 3 out of 4 respondents calling it "very important." Only 26 percent reported being “very satisfied” with the ease of getting around in their community. To learn about Feonix: Mobility Rising, read "Providing Rides Along Rural Roadways." Erik Gaikowski added that in some places transit vans will pass through a town without stopping. He emphasized the need to establish a "one-stop shop" coordinating all rides in a region. Communication is another part of the problem, noted Peg McDonough, planner and coordinator for the Age-Friendly Berkshires organization in Western Massachusetts. "People often don’t know about the transportation services they could use," she explained, adding that many older Americans are unfamiliar or uncomfortable with transit. Well-known companies such as Lyft and Uber have so far been slow to establish service in smaller communities. In some places, homegrown or volunteer-based versions are trying to fill the gap. The Maine-based iTNAmerica has built a nationwide volunteer-based network. Feonix: Mobility Rising (see sidebar) is a similar enterprise with a focus on the rural Midwest. Mobility means more than buses, transit vans and cars. Most older Americans grew up walking and bicycling, and many would welcome the chance to do more of it today if there were safe routes and pathways. In fact, according to a Rails to Trails report, people in towns with populations under 50,000 walk nearly as much as people in urban and suburban centers do thanks to streets with little traffic and businesses within easy walking distance. To improve infrastructure, and make walking safer, AARP Oklahoma helps small towns find grants to build safety improvements that the municipalities could not otherwise afford. "A $10,000 grant goes a long way in a town of 5,000," said state director Sean Voskuhl. In Talkeetna's 1997 mayoral race, a cat named Stubbs won as a write-in candidate. He served until his death in 2017. Although Talkeetna, Alaska, is very rural (it sits on at the southern edge of Denali, North America's tallest mountain peak) and very small with a tiny population (876), it has a train station and a walkable downtown. To help make your community more walkable, check out the AARP Walk Audit Tool Kit. Out of that came measures to calm traffic on the main street through downtown, repurposing some of the pavement for a footpath and opening pop-up businesses in the mostly vacant storefronts. Benches, bike racks, public art, a parklet and a holiday market followed, with help from AARP and the placemaking firm Team Better Block. The most important lesson learned, according to Stone: "Say yes to new ideas and then experiment to see if they work." Spiraling housing costs and shortages are most often associated with booming cities, but the same issues hit home in many rural communities. Rural communities are often a mix of pricey new houses and old homes in need of repair. While satisfaction with their cost of living is low among survey respondents in the Midwest (23 percent) and South (21 percent), it's even lower for those in the West (8 percent) and Northeast (6 percent). To learn about housing solutions for all types of communities, download or order Making Room: Housing for a Changing America. Rising utility costs are a problem throughout Colorado, said AARP state director Robert Murphy, while soaring rents and home prices are creating additional problems for older residents in the western part of the state. In Montana, people are moving to rural areas from out of state, which raises housing costs for older people who don’t own homes, explained Steve Reiter of AARP Montana. Many are forced to move farther away from town — and farther from their friends and basic services. Rapidly increasing housing costs makes life tough even for homeowners, who find themselves asset-rich and cash-poor because of steep increases in property taxes. In Maine, many rural homes do not have first-floor bedrooms and bath. A problem in rural Massachusetts is that most homes were designed as single-family residences, which don’t serve the needs of older people who may need other kinds of living arrangements, said Peg McDonough. We need more incentives to interest housing developers in building in small communities, said Iowa's Bill Menner. "Show them they can make money here." Two decades ago, a rural renaissance was widely predicted with the rise of the internet. People could live and work anywhere, and millions would move into idyllic smaller communities where they could enjoy the benefits of big cities but online. What was overlooked in this scenario was the complication of bringing high-speed broadband internet to the countryside. Water Street in downtown Eastport features shops, restaurants, a waterfront park, the local library and a Little Free Library (shown). Beautiful, remote Eastport, Maine, has a symphony, a theater, affordable housing, walkable streets, water views, good broadband service and more. What it lacks is enough people (population 1,300 — and dwindling). The easternmost community in the nation, Eastport promotes itself as a great place to relocate to and telework from. To learn more about Eastport, Maine, read "Wanted (and Welcome): Teleworkers." Considerably less than half of the people in the room raised their hands when Kelly Wismer of The Rural Broadband Association asked who had good broadband service in their communities. George Cleveland, a volunteer from New Hampshire's Mount Washington Valley, cited broadband as one of the most critical elements of livability in a community like his. "The expansion of high-speed internet can make a huge difference for small towns because, among other things, it opens opportunities for people to work remotely," observed Guillory. "Without it, it's harder for younger people to move or stay here." Although programs exist to help bring high-speed internet to rural areas, many communities still aren’t convinced about the benefits of broadband, noted Laura Lee of the Maine Community Foundation. Meanwhile, people in other places are tired of waiting for telecommunications corporations to reach them and they're looking at ways to start broadband networks on their own, said Joy Beressi-Saucier, also of Maine. Wismer suggested that rural telephone cooperatives take on providing broadband service. "People take pride in the place they live, so we need to work with that," said Tanya Johnson, director of AARP Wyoming. "You won't get anywhere starting with the assumption that something is wrong or missing in their town." "We need to frame livability differently in rural areas because it's often seen strictly as an urban concern," said DeAnza Valencia of AARP New Mexico. Sue Lessard cautioned that outsiders wanting to help a rural community need to work with residents since "people won't respond if there isn't a trusted local link." Some farms in historic Davidsonville have been in the same families for generations (even centuries). Most of the still-active farmers are in their 70s, 80s or 90s. Rural areas aren't always distant places. Davidsonville, Maryland, is commutable to Baltimore, Annapolis and downtown Washington, D.C. Shopping and services are a short car ride away. It's a very livable place — for those who can drive, care for a single-family home, climb stairs, and maintain a lawn or large tract of land. To learn about a local ride solution for older adults, read "1,000,000 Rides and Counting." Go in with questions rather than answers, be prepared to listen and never pass up the chance to have a meal with people, advised George Man, based on his experiences working in Montana with Americorps/VISTA. Sean Voskuhl of AARP Oklahoma underscored the importance of partnerships, citing rural extension agencies, which operate in all 50 states, as a widely available example. "The USDA Rural Development agency is also a big help," according to Joe Bartmann of Dakota Resources. Another bit of advice: Community improvement plans can be more successful when done with neighboring communities in mind, rather than piecemeal town by town. In a world that feels ever more hectic and fragmented, small communities offer calm and connectedness. "A strong sense of community in small towns is already there," so you don't have to work to make it happen, noted Kelly Stoddard-Poor. Easy access to open spaces stands out as another asset rural communities can build on. LOR Foundation research shows that rural Americans see the outdoors as an important component of livability. "Recreation, for instance, is about being in a natural place, not just getting exercise," said Guillory. Main Street in Bozeman, Montana, leads to more than 80 miles of mountain trails. Natural places are never too far from rural business districts and small town Main Streets. Four out of 10 respondents to the LOR survey were "very satisfied" with the access to outdoor spaces in their communities. To learn about developing usable outdoor places, download or order Creating Parks and Public Spaces for People of All Ages. The migration of young people away from many rural regions changes the social dynamic, with older residents mourning their departure but also stepping up to fill the void. Challenging the stories that people tell themselves about their community is especially important in rural communities. One story that needs to be turned on its head, declared Gaikowski of AARP South Dakota, is that any community that loses population is doomed. "A community can be thriving even if it's not growing," he explained. "It's a mistake to assume that a town is dying just because it has fewer residents than in the past. That diminishes all of the positive things going on every day. Such a view leads communities to invest all of their energy and resources into attracting new businesses, rather than paying attention to the lives and the needs of people who are already there." Jay Walljasper is a Minnesota-based journalist and author of The Great Neighborhood Book. A writer-in-residence at Augsburg University, he writes, speaks and consults about livable communities.